A few weeks back I told you all that I was starting the Great Purge of 2015 (please read that in the big booming announcer voice that I imagine in my head...dramatic pauses and all). You can read all about the start of things in this blog post here. 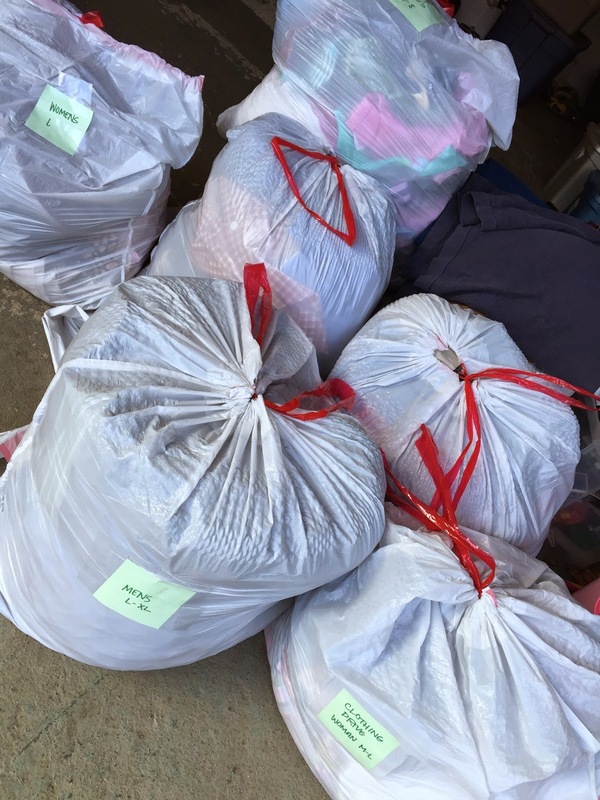 We wound up donating 11 bags of clothes and shoes to the school! 11 bags of stuff just sitting in our house that we didn't wear, didn't fit or we didn't truly love. I suspect we could have filled a few more. What's exciting is that my husband got in on the plan too and finally went through some old tubs of things that he has been meaning to sort through I've been nagging him about for awhile. My daughter has been able to keep her two spaces organized for 2 weeks. This is seriously more than amazing. I should take a picture of the rest of her room so that you have a basis of comparison, but I'd be too embarrassed for you to see it. Small victories here, people. We need to work on the new folding, but the fact that things are sorted according to type of clothing and you can still see what everything is is nothing short of incredible. My son's was the last room I tackled and I folded his shirts like I had done mine, according to the KonMari method. We're only 2-3 days into the process for him, so no pats on the back for me here. We'll see. If he can manage to keep this in order, it is proof that this woman is a genius and you should all run out and buy her book now. -I didn't love a lot of my wardrobe. I know that I mostly buy clothes as functional, body-covering pieces of fabric. That is a sad statement. I struggled mostly with getting rid of tired, sad-looking long sleeved t-shirts because I am always always always cold. But having a closet and drawers full of tired, sad-looking clothing makes for a tired and sad-looking person. So I gave myself permission to let go of those things (most of them were just tossed!) and to buy some new warm something or others when the time came next year. -I hold on to a lot of things because I think I might need them someday. But I get dressed everyday. So why do I want or need a closet full of things I might use someday and have to work around them everyday to get to the clothes I actually KNOW I do need. Silly...frustrating...time wasting...done. Those things went too. 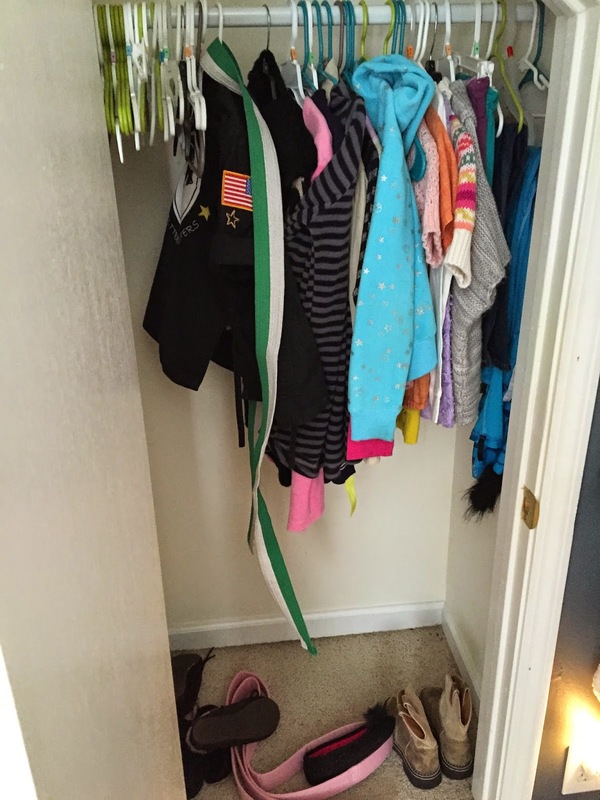 -My kids actually like being able to find the clothes they love and to wear them. Genius! Instead of making them hold on to stuff I like and they don't (counter-productive) we kept the items they love to wear and donated the things they don't. 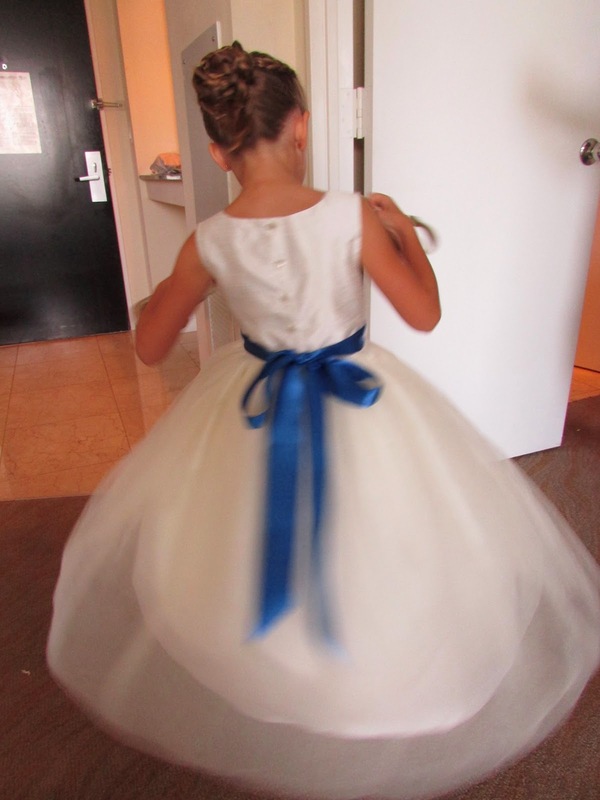 And because of that, they were ok with the one or two items - a collared shirt for my son and a dress for my daughter - that they weren't crazy about but knew were necessary every once in a while to wear. The larger bins up top hold folded squares for the inner cash envelopes. The smaller bins are solid kona scraps for letters on cosmetic cases, and state silhouettes. 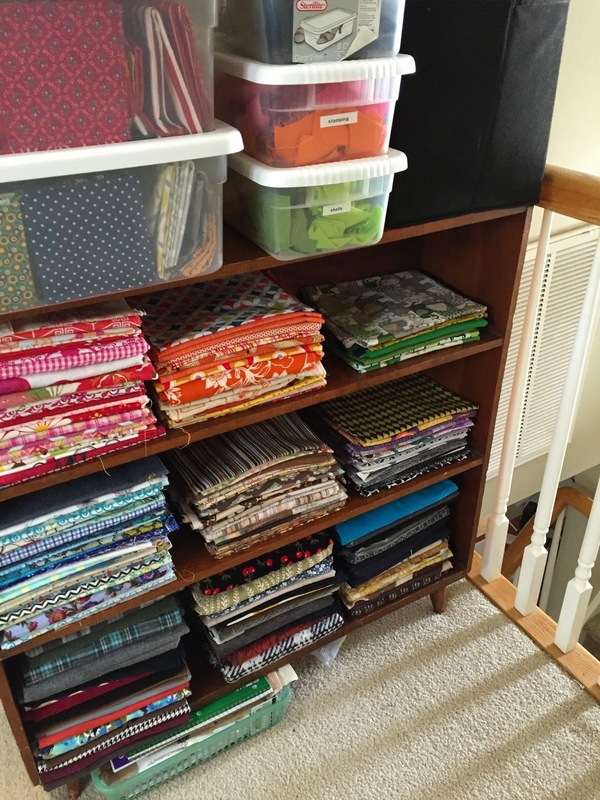 The shelves below hold larger pieces of fabric, all arranged by color and ready to be used on all your orders! And I have three rather large piles of fabric to send on to other homes. I'll be working on destash listings this week. There are bits of flannel, and corduroy and quilting cottons, and even some home decor stuff. I'll get them all sorted and arranged, and if you'd like to claim any - they will be available for a song! Well, mostly for shipping, but you get the idea. 1. Buy clothes that I actually, really truly love. Items that look good on me, fit properly, are made well and will last. They can still be practical and timeless so that they don't look ridiculous once a trend has passed, but well made items hold up better. They may be more expensive, but I'm going for quality over quantity from here on out. 2. Learn how to make my favorite shirt. In The Purge, I came across a shirt that I absolutely love. And I've loved it to death. It has pulls and stains and it's just time to let go. And I'm sad. But guess what? I know how to sew!!! So, I am going to take apart my old shirt and learn how to duplicate it. And yes, I'll take you along for the ride, so more on that later. 3. Continue to look my clothes over honestly, and get rid of the things that don't spark joy. Life is too short. Let them go and give joy to someone else. There were lots of good things that we gave away. The hole-y, stained things we just tossed out, of course. But there were 11 bags of good pieces and they can now go on to spark joy for someone else. And that makes me happy too! But books is next on the list, and I've even cheated a little. There are 4 boxes of kid's picture books slated for giveaway already. We might be having the mother-lode yard sale here soon people! I'm giving myself two weeks to go through all the books. And I'm telling you about that, so that I'll follow through. So, look for an update on that on Monday, May 18. Eeek! Have you joined The Great (ate ate ate) Purge (urge urge urge) of 2015 (if-teen if-teen if-teen)? I'd love to hear about it! I lost so much during the flood of Hurricane Sandy that I was taken to a new place mentally regarding "stuff". My Mom and Daughter lost things but they were mostly mutual things, OUR home things. I lost my entire album collection (which I should have purged years ago so now others could be enjoying them), my personal correspondence with friends (many now deceased) over the past 40 plus years, and many beautiful books, sketchbooks, & thousands of dollars of art supplies, in addition to my studio having to be totally gutted of its built in shelving/furniture. SO you see, I have a new mindset. I have been purging for 2+ years now and am STILL purging. I ONLY have things my closet I LOVE to wear. I ONLY have things in my room I LOVE to look at. I ONLY have books on the shelf that I read/need for work. I have re thought my purpose as an artist in how I make art, what I make, the size of it, etc. My design partner and I have made many donations of art to worthy organizations. My Mom & Daughter have purged too, not as much but they have realized that Karen can't take care of all of everyone's stuff so they must find worthy homes for the things they love that they don't need. I have a wonderful friend who has been working with me to EBay so much. Can't believe the extra cash I have made with her help and I don't miss a thing. I have even gone into hallowed ground such as my Barbie wardrobe....and the doll house.....I have kept what I made, what my grandmothers made and a few really precious pieces. I struggle with my Mom who is 85 and not wanting to get rid of anything. She has come around a lot but is working from a different mindset...to her this seems like an ending not a new beginning. She is not well and I have concluded that seeing so much change in such a short time has really stressed her.......I am patient. We have pulled our home back from near destruction with the help of friends, family and our own perseverance. I hope that you will all take something from my story, as I took so much from Allison's. Thanks, Allison for giving me the opportunity these last few minutes to write this down. Writing about your "stuff" is such a cleansing purge also. Thank you for sharing. I cannot even imagine the loss that you and others felt and are still experiencing after Sandy. I watched from afar and that was painful enough. We have moved across the country 3 times, back and forth from CO (we can't make up our mind..haha..) and have purged a ton before each move and we STILL have so much. I am learning to let go. It's just stuff. And can be such a blessing to others. Hopefully what we are left with are the things we love and will use. That is my goal, my hope :) All the best to you!